MATENS: A Heaping Helping of Kudos for President Trump, Served Up By...Governor John Bel Edwards? MATENS: A Heaping Helping of Kudos for President Trump, Served Up By…Governor John Bel Edwards? Well, this story isn’t likely to leave the Katy Waldmans of the world feeling all warm and fuzzy. But we Louisianans may take heart! Because yesterday, our democrat governor heaped praise on republican President Donald Trump for his strong and prompt response to Louisiana’s request for federal support on the heels of Hurricane Harvey hitting our coast and bringing the pain in the form of destructive winds and rain. 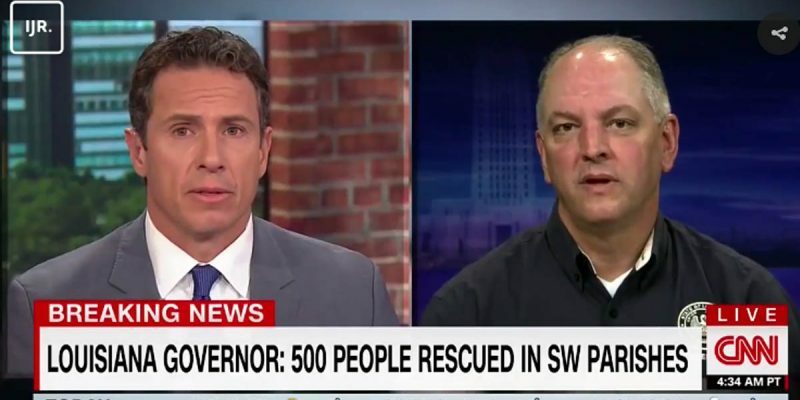 President Trump acting swiftly on behalf of Louisiana and the Gulf Coast, Governor Edwards gracefully accepting help from the Trump administration in aid to his ailing state…both men putting people before politics. Showing leadership. Making us proud. Trump’s doing some good work for Louisiana, and for our neighbors in Texas, in this time of extreme crisis and untold suffering for so many. Let’s take a cue from our governor and give credit where credit is due. Stay classy, Louisiana. Previous Article Can We Make Some Predictions About Baton Rouge’s Next Police Chief Now?